Abbie and Sam Roberts. In addition to their 67-year marriage, they were partners in the news business for many years. Samuel E. "Sam" Roberts was publisher of The Lincoln County News from 1966-1992. 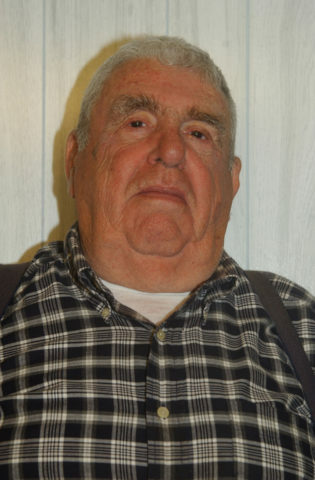 Roberts, 87, of Nobleboro, died Tuesday, Nov. 6. Samuel E. “Sam” Roberts, 87, third-generation publisher of The Lincoln County News from 1966-92, died at LincolnHealth’s Miles Campus in Damariscotta early Tuesday, Nov. 6. A leader in the state and regional newspaper industry throughout his career, Roberts belongs to the halls of fame of the Maine Press Association and the New England Newspaper and Press Association. Roberts of Nobleboro was equally active in the local community. He was a co-founder of the Central Lincoln County Ambulance Service Inc. and Damariscotta Bank and Trust Co.
“Sam was the patriarch of the family,” the Roberts family said in a statement. “He had ink running through his veins from an early age. He worked extremely hard all his life and he expected the same work ethic from his family. After retirement, Roberts held the title of publisher emeritus, and remained a frequent presence at the newspaper office and printing plant in Newcastle. Roberts had bladder cancer and myasthenia gravis, a disease that causes weakness and rapid fatigue of voluntary muscles, among other ailments. “Even when his health was failing, he would come to the print shop and sit and watch the equipment run and watch his son and grandsons work,” the family said. “While gravely ill and in his hospital bed, he wanted to see pictures of a new piece of equipment and wanted to know every detail about it. Samuel Erskine Roberts was born Nov. 18, 1930, to Francis C. “Fred” and Dorothy E. Roberts. His grandfather, Samuel H. Erskine, published the first edition of The Lincoln County News in 1920. His mother succeeded Erskine as publisher. Sam grew up in the business and, according to family lore, could operate most of the presses in the print shop by the time he was in grammar school. With his father ill and his mother busy at the newspaper, the family sent Sam to boarding school at Fryeburg Academy. He never graduated high school, opting instead to join the U.S. Navy in 1949. While on active duty, he worked as a printer aboard a heavy cruiser, the USS Albany. He was in the Navy until 1950 and the Navy Reserve from 1950-56. In 1950, he returned to the newspaper and printing business. He married Abbie A. Henry on Aug. 11, 1951. They had been married 67 years at the time of his passing. 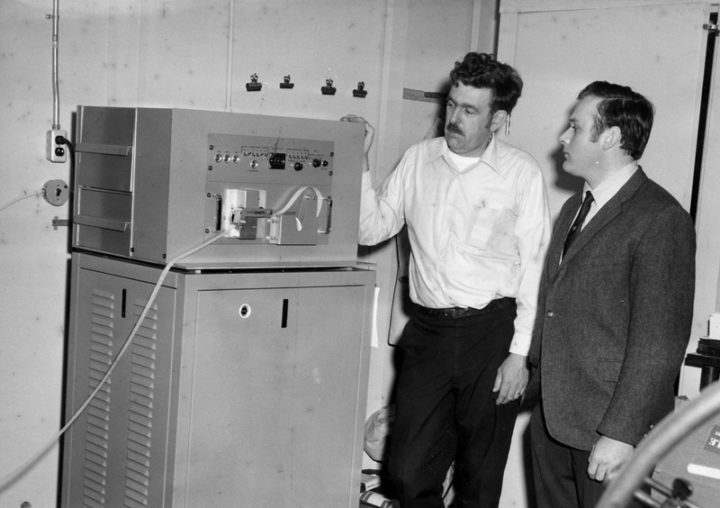 Sam Roberts (left) examines a Compugraphic typesetting terminal after its installation at The Lincoln County News circa 1969. The system was the first of its kind in the state. “His father died young, so a leadership role was thrust upon him at an early age,” the family said. Roberts became owner of the newspaper and its parent company, Lincoln County Publishing Co., March 31, 1966. The newspaper grew quickly under his leadership. He bought the Waldoboro Press in 1967 and merged it with the LCN the next year. In November 1982, he moved the newspaper and print shop from Church Street in Damariscotta to the former Hunt Brothers building in Newcastle, which would expand greatly in the years thereafter. The newspaper remains at the Mills Road location today. Roberts was proud of his work to shepherd what was then the New England Press Association through a fiscal crisis as the organization’s president in 1986. The organization continues to operate today as the New England Newspaper and Press Association. “There would be no New England Newspaper and Press Association today, as we know it, if not for Sam Roberts,” said Earl Brechlin, a former Maine newspaper editor who later served on the board with Roberts. Roberts was president of the Maine Press Association in 1969-70 and was a former state director of the National Newspaper Association. He was inducted into the New England Press Association Hall of Fame in 2000 and the Maine Press Association Hall of Fame in 2002, the latter with his wife, the newspaper’s former managing editor. Back home, Roberts was the founding president of Central Lincoln County Ambulance, established Jan. 6, 1972. “We organized it all within a month,” Sam said in a 2013 history of the service by his daughter-in-law, Paula Roberts. He had volunteered for prior ambulance services. As state regulations grew and the last for-profit ambulance service in the area went out of business, local doctors asked him to start a new one. In the early days, an answering service would relay calls to the newspaper office during the day and the Roberts home after hours. The early 1970s were a busy time for Roberts. He was a founding director of Damariscotta Bank and Trust Co. with a small group of local businessmen. The bank opened in February 1973. Roberts was “one of 14 businessmen who had a vision of building a new bank in town to help small-business men like himself,” the family said. He chaired the Damariscotta Planning Board for 15 years and was a longtime member of the Damariscotta-Newcastle Lions Club, a longtime member and vestryman of St. Andrew’s Episcopal Church, and a longtime volunteer with the Miles Memorial Hospital League rummage sale. He joined The Massasoit Engine Co. in 1951, responding to calls for 55 years and serving as a trustee. He was an honorary member and the company’s longest tenured living member at the time of his death. At one time he was president of Alfred’s Inc., a restaurant enterprise in Augusta. Roberts retired from the newspaper Nov. 18, 1992. His son, Christopher A. “Chris” Roberts, took over as publisher. Chris Roberts remains publisher today. His sons, John and Allan Roberts, are associate publishers. Chester Rice of Walpole knew Roberts for more than 50 years. Both were active on the engine company and in town government, Rice as a selectman and Roberts on the planning board. They were bank directors together and Lions together. The business and civic leaders were friends, too. After Roberts’ retirement, he wanted a backhoe to work around his property. Rice, with his expertise from a career as an excavation contractor, drove Roberts around to find one. “I don’t think we ever had a bad word between us in all the years I knew him,” Rice said. Brechlin, a former editor of the Bar Harbor Times and Mount Desert Islander, served on the boards of the Maine and New England press associations with Roberts. Brechlin described Roberts as a larger-than-life figure in the industry in the late 1980s and early 1990s. He remembers a speech by Roberts as president of the New England Press Association. Wearing a tuxedo, the printer from rural Maine enthralled a crowd of some 600 New England journalists. “He held the room — always had a great story,” Brechlin said. Roberts’ survivors include his four children: Beverley, Deborah, Christopher and Frances. Like Roberts, his children worked in the business from a young age, helping in the print shop and collating books at the family home at the end of the day. For many years, the family lived in the Nash House on Bristol Road, near downtown Damariscotta. His children fondly remember summers at the camp, where, if the tide was right, he might come home for lunch and take them water-skiing. During a camping trip in Baxter State Park, 11-year-old Beverley fell into the water at Nesowadnehunk Falls. With help from a family friend on shore, Roberts went in and rescued her. Roberts was handy as a builder and mechanic. He helped his son and grandsons build their homes, all in Damariscotta. If a piece of equipment in the print shop broke down, “nine out of 10 times he could fix it himself,” the family said. 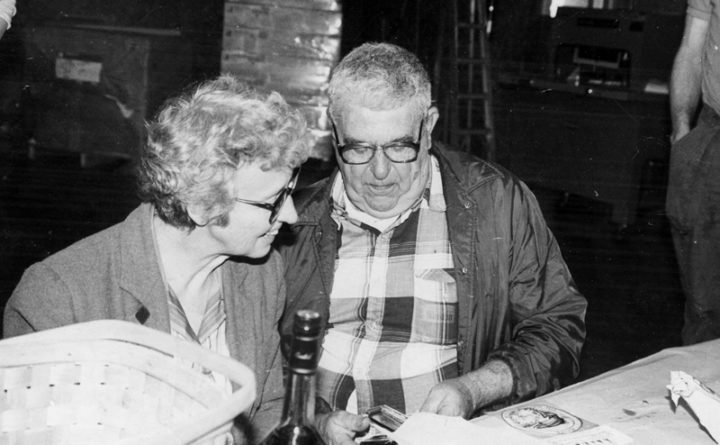 In the 1980s, Sam and Abbie Roberts moved to the Damariscotta Mills area. In retirement, Roberts could often be found on his excavator or tractor, working on their property at the corner of Borland Hill and West Neck roads.